Terms and Conditions of Service and Recycling Material - RW Landscapes - Innovative Garden and Landscaping Solutions - Hitchin, Hertfordshire. RW Landscapes reserves the right to add additional costs onto the total agreed price, upon unforeseen complications during excavation, that is, location of manhole covers not visible prior to commencement of work. RW Landscapes reserves the right to take a deposit upon acceptance of the contract, the amount is agreed in the contract paperwork. 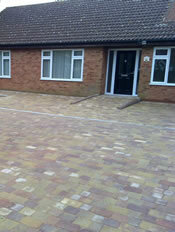 RW Landscapes request payment in full within 20 days upon completion of the contract. RW Landscapes reserves the rights to ownership of all products in the contract until payment is received in full. Entry of work site during installation by parties not employed by RW Landscapes is at their own risk and therefore RW Landscapes will not be held responsible. Aspects of project installation may be weather permitting. RW Landscapes reserves the right to alter timescales to ensure the quality of installation is maintained. We recycle as many materials as possible, including all green waste! Any waste that cannot be recycled is disposed of in the correct manner. We actively encourage the use of reclaimed materials i.e. bricks, rockerys, fountains and M.O.T -This has previously been used in bases most commonly roads, it is refined instead of being taken to a land fill sites.